SNASK. EMPOWERING THE CHILD TO MAKE HIS OWN FOOD CHOICES. What if you had to plan every single meal based on the carbs ? This is the daily routine for children with type-1 diabetes, an incurable lack of insulin production. We are introducing SNASK, a monitoring system for children with diabetes, that allows for easy flow of information between parent and child. 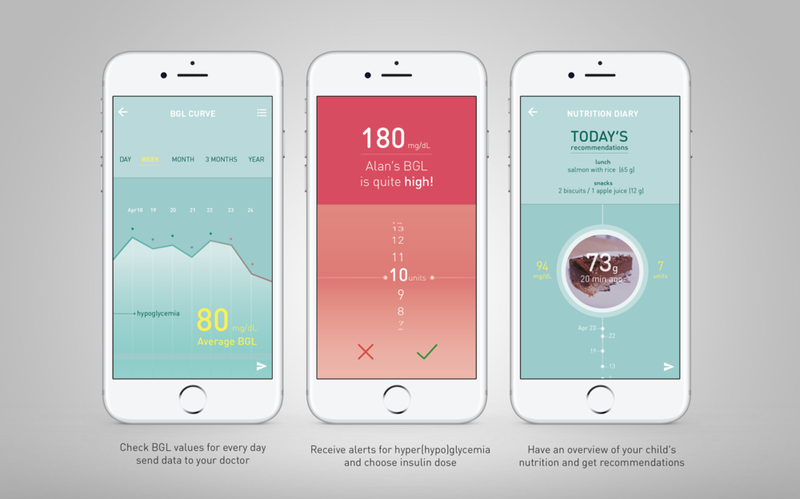 SNASK uses infrared molecule scanning technology to provide nutrition data about carbohydrates and gives personalised recommendations regarding insulin intake. 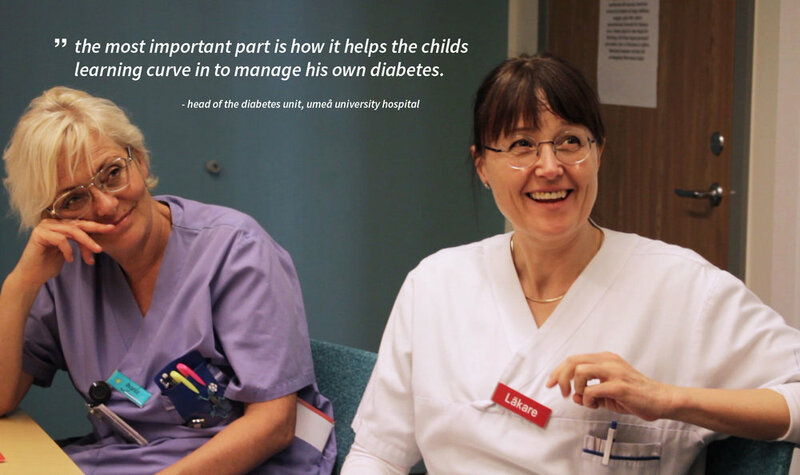 This project was conducted in close cooperation with Umeå University Hospital Diabetes Unit. The SNASK scanner uses infrared molecule scanning technology to provide nutrition data about carbohydrates. The child wears a patch that combines a glucose monitoring device (cgm) and insulin pump.
" The most important factor is the child's own learning curve. He needs to learn how to monitor his own diabetes. Parents are constantly worried about their child. 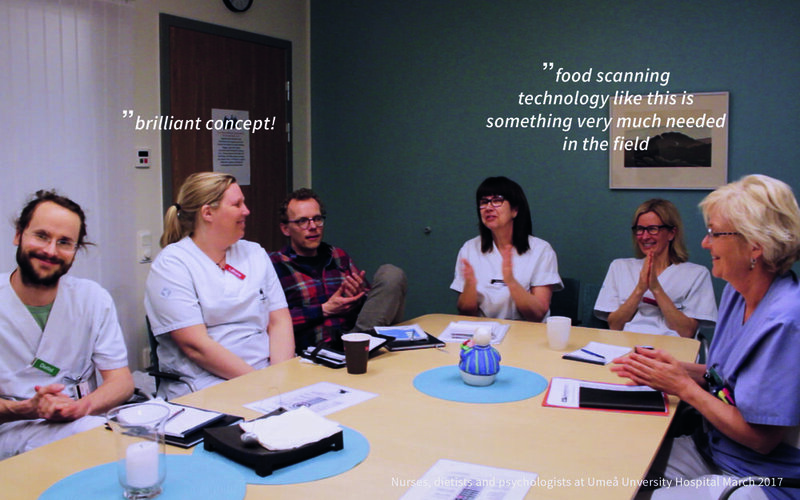 We had several one-on-one interviews with nurses and specialists at Umeå University Hospital. The most valuable feedback we got, was that the product should encourage the child to be more autonomous. We started the first week by with extensive contextual interviews with nurses, parents and with searching for facts and how people commented on on social media parenting groups.
" 75% of of children with type-1 diabetes usually fail to achieve the recommended blood sugar level, when they are not supervised. Deciding what to eat is based on the carbs contained in each meal. For every 10 carbs, 1 unit of insulin is needed. The problem is that, young children are too inexperienced to understand what and how much they should eat. Therefore, an adult always needs to be present in order to calculate carbs.
" We discovered that the connection between parent child is put at a major stress when parents are constantly supervising their children, making them feel disempowered. In this project I took the lead on connecting people together and prototyping aspects of the mock-up such as textiles and UI on a graphical level. I took the lead on the Storytelling, structuring the user journey and what interactions the device would have towards the user (child). In the end I believe the mock-up (model) is a bit too big of scale, but this was perfect to show to the nurses that the technology could be used in their field and not only the fitness/health field. I would have liked for us to test with more children, but due to the short span of two weeks we chose to focus on the experts from the hospital . Today parents of children with diabetes fear of letting go of control, and they are not trusting others to take responsibility for their own child. The child can have the scanner always with him and send updates to his parents throughout the day, while the patch on his arm regulates his blood sugar level and makes the necessary insulin injections. As a way to shorten the child's learning curve and encourage him to take responsibility over his disease, he can actually choose when to do an injection by pressing the button on the device.